Madikeri Fort is a historical landmark of Coorg. The fort stands in the center of the Madikeri town, still preserving the remnants of a bygone era within its proud walls. Some of the elevated structures inside the fort present astounding view of the surrounding areas. Needless to say, the fort is one of the most famous tourist attractions of Coorg. The Madikeri Fort was constructed in the later part of the 17th century by Muddu Raja, the then king of Coorg. Since then the fort has seen many changes. 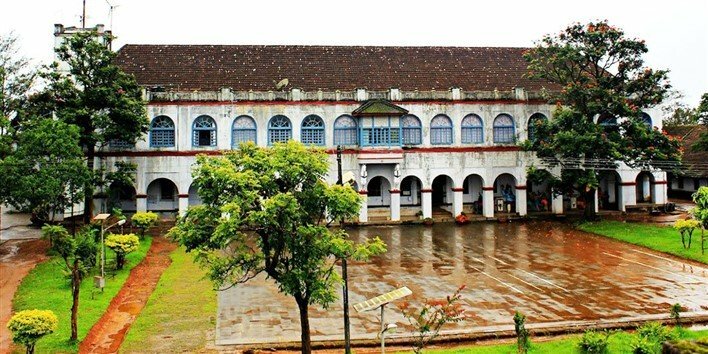 However, this imposing structure has stood the test of time and has become a standing witness of Coorg’s history. Today the fort premises house the Madikeri Deputy Commissioner’s Office. The long history of the Madikeri Fort can be traced back to the 17th century when Muddu Raja had made Madikeri the capital of Coorg. The fort was built as a mud structure. The king had also constructed a mud palace inside the fort premises. However, when Tipu Sultan captured the fort, he ordered to reconstruct the structure in granite and named the site Jaffarabad. The rule of Tipu Sultan over the fort was cut short by Dodda Virarajendra who captured the fort in 1790. The fort faced further changes and renovations during the period 1812 – 1814 when it came under the rule of Lingarajendra Wodeyar II. In 1834 the fort was captured by the British rulers of India. These British rulers went on to make further additions and modifications to the fort and the structures within its solid walls. Madikeri Fort is a unique fort that houses among other structures a temple, an Anglican Church, a prison and a museum. The fact that a Church stands within the walls of the fort signifies the dominance of the British people over the fort. The St. Marks Church was built by the British in 1855 by removing a temple of Virabhadra from the inner fort and making place for the construction of the church. It was built in the Gothic style with stained glasses windows. The fort is believed to have a few secret passageways and that adds to the mystery of the fort. The Madikeri Fort showcases beautiful architectural designs. Two life-size stone replicas of elephants stand in the north-east corner and draw the attention of the visitors upon their entrance to the fort. The palace structure is a huge and spacious one. This two storied structure is 110 feet in length. The structure was renovated twice by the British rulers. In 1933 they added a grand clock tower to the fort. They also built a portico to park the commissioner’s car. The palace also has a sculpture of a tortoise with the initials of King Vijayarajendra etched on it. The fort has a small square mantapa built of stone and enriched by beautiful surroundings. It stands on a high level ground and provides a splendid view of the surrounding areas to the west. This mantapa is believed to have been a favourite spot for relaxation of the erstwhile kings of the fort. The Madikeri Fort exists as a unique link between the present and the past. The St. Marks Church has been converted into a museum under the management of the State Archaeological Department. This museum preserves several historical artefacts and antique items related to the fort and the surrounding areas. The artefacts are mainly from the British rule era. A section of the museum is dedicated to awards and honours bestowed upon Field Marshal K. M. Cariappa from the Indian Army and Kodagu’s eminent personality. The Kote Maha Ganapathi temple is considered to be the oldest part of the fort and the most visited one too. Madikeri is a small town of Karnataka but it is well connected to other cities and towns in the state and beyond by the road network. As such, reaching Madikeri is a simple matter. As the fort is located in the centre of the town, it is also easily reachable from any part of Madikeri. Madikeri is situated near the Karnataka State Highway 88 that runs from Mysore to Mangalore. So, it is well connected by the road network. There are several public buses that connect Madikeri to a number of places in Karnataka and Kerala. There are frequent KSRTC buses that connect Madikeri to Bangalore, Mysore, Virajpet, etc. Visitors can also reach Madikeri by private cars and hired cabs. Madikeri does not have a railway station of its own. The nearest railheads are located at Hassan, Kasaragod, Kanhangad, Kannur and Thalassery (each of which is situated around 115 km away from Madikeri). Mysore and Mangalore are at a distance of 140 km but are good alternatives to reach Madikeri through the train route. The airport at Mysore is the nearest one as the small town of Madikeri has no airport. Mysore is connected to Mumbai, Delhi, Kolkata, Chennai, Hubli, and Dubai via Bangalore. The Mangalore International Airport at Mangalore can also be assessed to reach the town of Madikeri.